Rosemarie Cooper, MPT received the BA degree with concentration in International Business from California State University, Sacramento in 1994. She received the MPT degree in Physical Therapy from University of Pittsburgh in 1998. She is a RESNA certified Assistive Technology Professional (ATP). 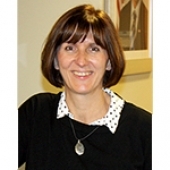 She is currently employed at the University Pittsburgh in the School for Health and Rehabilitation Science as Assistant Professor and Instructor within the Department of Rehabilitation Science Technology. She is the Director the UPMC Center for Assistive Technology and works as a Clinical Instructor/ Wheelchair Seating Clinician at the center. Rosemarie Cooper has been an author on several articles on wheelchairs and seating. She is a member of Beta Gamma Sigma, Business academic honor society and a member of APTA.